model developed a couple of years ago at the CPU Appropriate Technology Center, Philippines. It has improved design but simpler, uses locally available materials, and follows simple fabrication procedure, which all together contributed to the significant reduction in the cost of the stove. The design improvement was done by a group of researchers from the PT Minang Jordanindo Approtech – Research and Development Division namely Franciscus Trya Garleman and Daniel Belonio. The stove basically is a modular type consisting of the following components: (1) Burner Assembly, (2) Reactor Assembly, and (3) Char Chamber Assembly. The burner is where combustible gas is burned to produce the required heat for cooking. 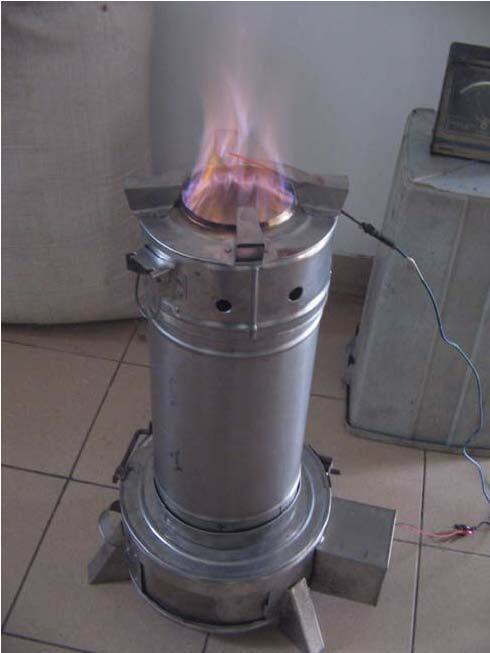 It consists of a rectangular holder that support the pot in place during cooking, a burner plate that distributes the gas for even heating, air holes for the entry of the secondary air needed for the combustion of gas, and a handle for ease of removal of the burner especially when reloading fuel. The reactor assembly is where rice husk is gasified by introducing limited amount of air, just enough to cause combustion of fuel. It basically consists of an inner and an outer cylinder having a diameter of 15 and 20 cm, respectively. Between the cylinders is a rice husk ash insulation to confine heat inside the reactor. The char chamber assembly is where char is discharged. It consists of the cylindrical chamber for the storage of char having a diameter of 30 cm and a height of 15 cm, a sliding-type exit door for ease of removal of the char, a grate that holds the rice husk fuel in place and to discharge it for disposal, and an air inlet port where the 220V-0.15 Amp fan is placed to supply the air needed by the fuel to gasify. 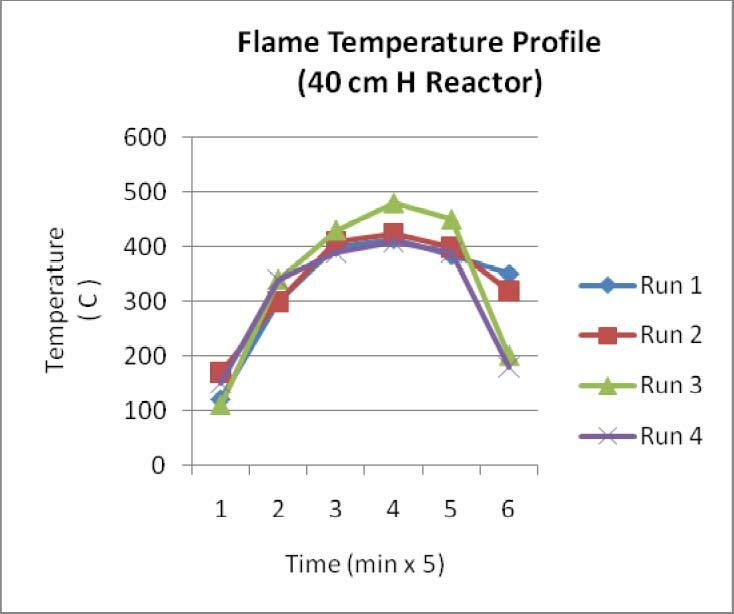 Performance evaluation showed that the stove has a power output of 1.4 to 1.9 kw. 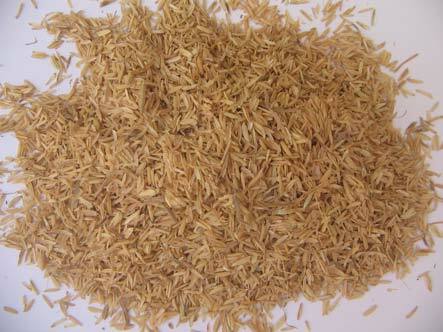 It consumes rice husk at a rate of 1.4 to 1.7 kg per hour. Gas can be generated within 10 for 10 cm reactor and 40 minutes for 60 cm reactor from the time the fuel is ignited using a burning piece of paper. One and a half liter of water can be boiled within 6 to 9 minutes. 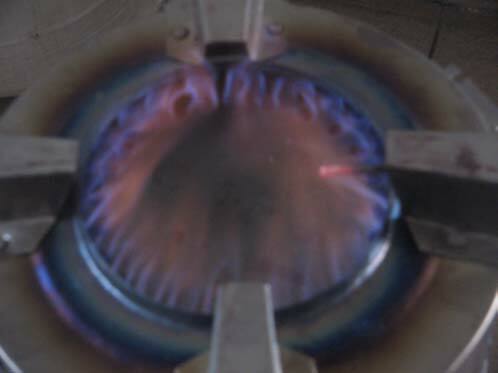 Flame temperature measured directly at the bottom of the pot ranges from 400 to 470 C. Results of the analysis revealed that the stove has a specific gasification rate of 81.5 to 97.1 kg/hr-m2 and a fire zone rate of 1.6 to 1.9 cm/min. Thermal efficiency is relatively high for this stove which ranges from 23.2 to 36.9 % especially with the use of a burner sleeve. The stove comes in four different heights of reactors – 30, 40, 50 and 60 cm. The 30 and 40 cm reactors are recommended for short time cooking, like heating water for coffee or for heating food. The 50 and 60 cm reactors are applicable for meal preparation (which include rice and simple dishes) and other home cooking activities. The stove can be used for a longer operation by disposing the char and refilling the reactor with fuel. The stove is convenient to use, almost similar to LPG stove. Almost no smoke is observed during operation. It can be considered an environment-friendly technology since it can address the problem of rice husk disposal and CO2 emission is very minimal compared with the traditional direct combustion stoves. The stove costs Rp 200,000.00 (1 US$ = Rp 9,200) for the unit made of ordinary steel sheet while Rp250,000.00 for the unit with parts made of stainless steel. Operating cost analysis disclosed that the stove operates at a cost of Rp663.97 per hour of cooking. A yearly savings of Rp2,596,455.00 or Rp467,612.14 can be derived from using the stove compared with kerosene or LPG fuel, respectively. Thirty thousand units of this stove will be mass produced in Indonesia late this year for the initial phase and 400 to 500 units daily in the succeeding phases. Interested individuals or organizations who would like to adopt this technology may contact The President Director, PT Minang Jordanindo Approtech, Adhi Graha Bldg., 15th Floor Suite 1502A, Jl. Gatot Subroto Kav. 56, Jakarta Selatan 12950, Indonesia. Telephone: 62-21-5262545, Fax: 62-62-215262416; and Email: djoewito@yahoo.co.id.